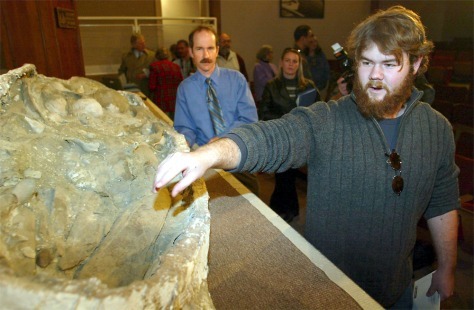 Jeff DiMeglio talks about the remains of an 8-million-year-old whale fossil Thursday at the Calvert Marine Museum in Solomons, Md. DiMeglio discovered the bones in September after Hurricane Isabel eroded the coastline. In the background is the museum's curator of paleontology, Stephen Godfrey, who was called to excavate the fossil.